In our own magazine Dedicated you can read about the IT challenges that our clients and we ourselves encounter. Dedicated is published as a paper copy but is also available as an online magazine. 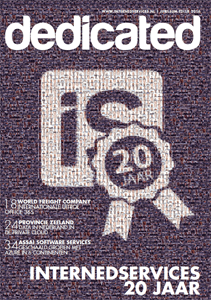 Filled with trends, inspiring columns, news from KPN Internedservices and interviews with our clients and partners. Our magazine is a business card that is worth the read. Whether you are a client, are interested in our organization or in IT in general.